Click Start -> Settings -> Printers and Faxes or, depending on de Windows version, Start -> Printers and Faxes. A new window Printers and Faxes will open with a list of available printers. In the upper left corner of this window is a section with the title Printer Tasks. Click within this section Add a printer. Click Next in the window Add Printer Wizard. Select the option A network printer, or a printer attached to another computer and click Next. 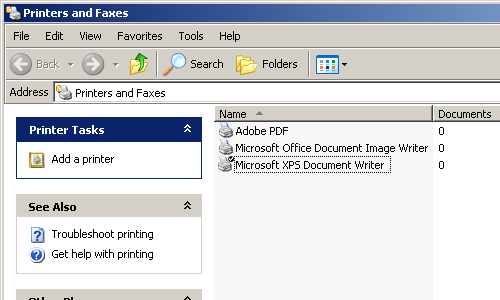 Select the option Connect to this printer (...) and enter at Name the exact name of the printer as specified in the table above. For the Ricoh printer at the Faculty of Science this is: \\payprint01.ru.nl\RicohMP5000 and click Next. In many cases, a window Connect to payprint01.ru.nl will appear now. This window will not appear when one has already been authenticated against the RU Active Directory, such as when one has logged in with S-number in the Study landscape, Science Library or the Info PC's. In the window Connect to payprint01.ru.nl enter at the field User name your student number, preceded by ru\, for example ru\s123456. In the field Password the corresponding password should be entered. For an S-number, this is the password for the RU-account (formerly called KISS-password). Finally click OK to continue. After that, you'll get a window asking whether you trust the 'printer driver' that you will be installing. After a few seconds you will get a question whether you want to use this printer as your default printer. Answer the question and click Next. If the newly added printer is a real printer, it should now be present in the list of available printers with status "Ready". The virtual printer uni_ps will show "Access denied, unable to connect" even when there is no problem. This page was last edited 15:26, 13 September 2012 by M Verleg.